After years of work, Colorado U.S. 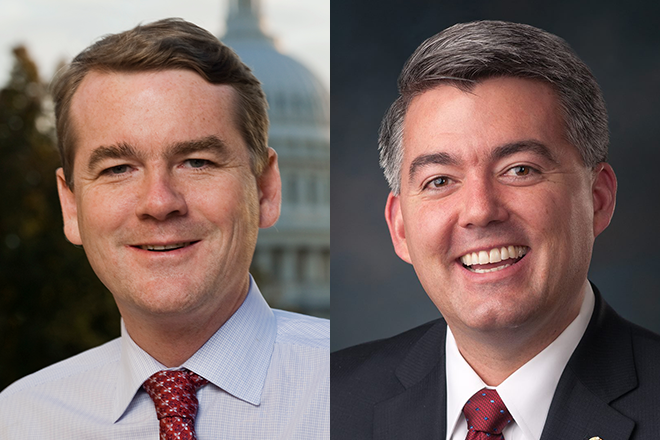 Senators Michael Bennet (D) and Cory Gardner (R) today secured a long-term fire funding fix in the omnibus spending bill being considered in Congress this week to end fire borrowing and improve how the federal government pays to fight wildfires. "The Forest Service plays an important role in Colorado's economy --affecting our water supply, outdoor recreation, and timber industry," Bennet said. "Its ability to budget effectively and efficiently is critical to our economic success. Because of the pressures that wildfires have brought to the West, as well as the challenges of climate change and development, the antiquated way we pay for firefighting needed dramatic change. This bipartisan fix transforms and modernizes the Forest Service's capacity to restore forest health and mitigate and fight wildfires. It allows the Forest Service to complete the entirety of its mission, without being undermined by the pressures of fire." "I have been working on ending the practice of fire borrowing throughout my time in the House and Senate, and today's announcement that our bipartisan fire funding fix is included in the spending bill is good news for Colorado," Gardner said. "Year after year, much of the West is forced to deal with horrible wildfires that burn millions of acres, and funding that should be applied to fire prevention and mitigation projects is instead spent by the Forest Service fighting these fires. Our provision will ensure the Forest Service has the necessary funding for cleanup and prevention efforts that will help reduce the amount of catastrophic wildfires the Forest Service has to fight." Unlike for other natural disasters, where agencies can draw from an emergency fund to pay for disaster response, the U.S. Forest Service and Interior Department do not have access to disaster funds and are forced to "fire borrow" - or take money from fire prevention and other non-fire accounts to pay to fight fires. The deal secured in this week's omnibus, based on the framework from Bennet and Gardner's Wildfire Disaster Funding Act, restructures how the Forest Service pays to fight wildfires, putting an end to fire borrowing and providing much-needed budget certainty through Fiscal Year 2027. The fire fix is two-fold: It freezes the ten-year average cost used to budget for wildfires at Fiscal Year 2015 levels, and also establishes a separate account for fire suppression that can be used once the cost exceeds these levels. The deal also includes conservation priorities that Bennet and Gardner have cosponsored, such as the reauthorization of the Federal Land Transaction Facilitation Act (FLTFA) that funds high-priority land conservation projects in Western states, and a two-year reauthorization of Secure Rural Schools. Lastly, the deal includes bipartisan forest management reforms, several of which improve upon Bennet-authored laws passed in the 2014 Farm Bill, such as stewardship contracting and Good Neighbor Authority.